Union members speak to the crowd at a Labor Day protest in Chicago. Hundreds of fast food workers, hospital employees and airport workers advocated for higher wages and benefits in a series of walkouts and marches. 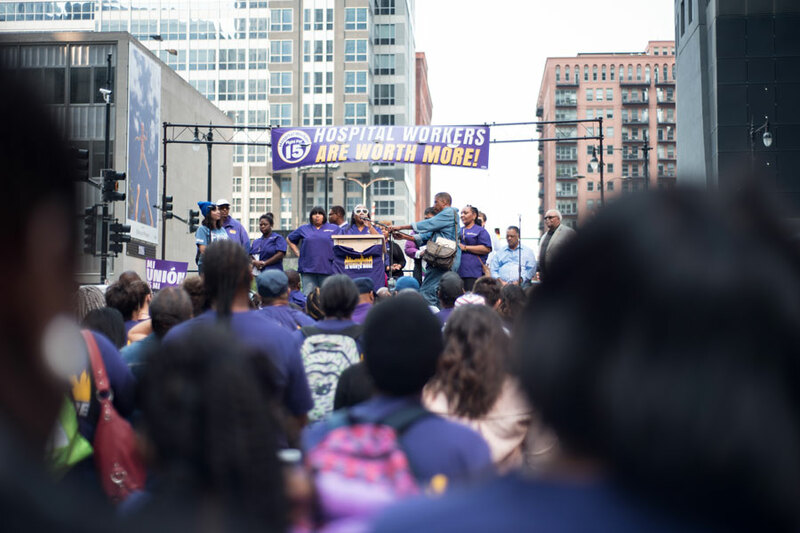 Evanston union members and Northwestern employees joined hundreds of fast food workers, hospital employees and airport workers in a march through Chicago on Labor Day to advocate for union rights and a raised minimum wage. Members of the Service Employees International Union demonstrated against low wages along with supporters of the Fight for $15, a national movement for increased pay and the right to form unions. Anita Strode, who has been a patient caretaker at Northwestern Memorial Hospital for 17 years, marched on Monday to support her fellow union workers. The day began with a large-scale strike of fast food workers and continued with a rally that started at the James R. Thompson Center before heading down Wacker Drive to Franklin and Randolph streets. Participants criticized Republican Gov. Bruce Rauner for vetoing a bill Friday that would have raised the minimum wage in Illinois to $15 an hour by 2022. Rauner justified the veto by arguing the raised wage would negatively affect businesses and end up reducing jobs. “There’s a principle as old as the Bible: You ought to get paid a decent wage, and no one who works hard ought to live in poverty,” Quinn said. Evanston representatives added their voices to the mix as well, with state Sen. Daniel Biss (D-Evanston) — who is running for governor in 2018 — participating in the march. In a statement Monday, he expressed his support of unions and condemned Rauner’s veto of the bill. In addition, some non-tenure eligible Northwestern faculty members — who became new members of the Service Employees International Union Local 73 in May — attended the march. Visiting sociology Prof. Jackson Bartlett, who earned two graduate degrees from NU, and his colleagues in the union participated to increase their visibility. Bartlett said some non-tenure eligible University employees face informal contracts, a lack of benefits and considerably lower wages than their tenured peers. Faculty members may be hired on a course-by-course basis, and some cannot be sure of their employment past the quarter’s end, he added. Because of this, he said, faculty members are using their union membership as a means to establish good contracts across the board. Bartlett said he and his fellow faculty members will continue organizing until the University sits down to bargain with them.